Recommendation: See it immediately, and then a few more times. Verdict: “Moonlight”’s humanity is deep and expansive and one of the most wonderful things you’ll see in a movie this year. I was nervous to sit down to this review. The wonders of “Moonlight” are so many, so varied and each one so integral to the whole that even now as I type, due to limited word count, I fear choosing what to explore and what to leave alone. Understand now: I use a broad stroke out of necessity. There’s so much more to explore. 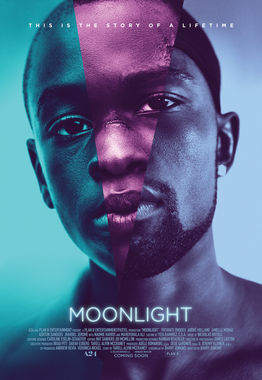 “Moonlight” is the second film of Barry Jenkins, previously lauded for his ultra-low budget film “Medicine for Melancholy.” It is based on the play “In Moonlight Black Boys Look Blue” by Tarell Alvin McCraney. We follow three chapters in the life of Chiron, an African American boy from Miami. First he is a young boy dubbed “Little” (Alex Hibbert) because he’s scrawny and meek, chased by cruel bigger boys into the path of Juan (Mahershala Ali, in an awe-inspiring performance, too brief) a kind drug dealer who steps up as his father figure. Then he is Chiron, a teen, still thin, still an outcast at school, questioning his sexuality. His mother Paula (Naomie Harris) has become a non-functioning drug addict and his relationship with friend Kevin (Jharrel Jerome) transforms in one lovely, quiet, moonlit night on the beach. But tragedy strikes when a fight at school sends Chiron to prison. Ten years later Chiron is Black (Trevante Rhodes), dealing drugs in Atlanta, silent and buff with gold fronts and chains. Kevin (Andre Holland) re-enters his life after a decade of silence. Jenkins has an incredible capacity for empathy. Every character feels real and true, never “written,” never “acted.” Chiron is a person, nothing more and nothing less. He is not a stand-in for a generalized black story, he does not represent a particular LGBTQ struggle. He has his own struggles and meets them in his own way. It is part of the heart wrenching beauty of “Moonlight.” There is momentum and agency in allowing a black character to simply be a person, without belaboring him with titles and comparisons. We would dehumanize him to make him into something larger, to make him a Poster Boy. “Moonlight” is full of romance. Forget the gritty “real-life ghetto” movies we’ve all seen about being black in America. Chiron’s life contains drugs, guns and poverty, but there is no grey-scale handheld designed to reflect all the bad feels that come with them. The film cascades, gliding through different shades of blue, the frames decadently lush and colorful. When Chiron walks into Kevin’s restaurant in the last chapter, a bell rings and music swirls, a moment reminiscent of love stories and fairy tales. There is hope and beauty in Chiron’s life that emerges even when things are at their lowest. All this adds up to pure, unfettered humanity. “Realism” has nothing on this– blurry images in browns and greys don’t add up to a “real” movie. “Moonlight”’s combination of singularly-focused empathy and dreamy, saturated imagery proves this. Chiron’s reality is laid bare for us as he uncovers himself, finds himself through misfortune and moments of glorious affirmation.